For many years we have enjoyed having the Lord’s Supper, also called Communion. Recently I had been reading the Gospel accounts of the Lord’s final week prior to His crucifixion. I noticed that in all the Biblical accounts, the Lord tells His Disciples to prepare the Passover meal, and that He will eat the Passover meal with them. We then see the Disciples sitting down to eat the Passover meal with the Lord, on the night before His crucifixion on the fourteenth of Abib [Nisan]. Uh-Oh! What is wrong with this scenario? For years we have commonly called this meal the ‘Lord’s Supper’ and ‘Communion,’ but as I was reading these Scripture passages, the Heavenly Father opened my eyes to what the words of Scripture actually say. He revealed the fact that what I had been practicing and enjoying all these years as ‘Communion’ was not ordained by Scripture, but was simply a man-made substitute for the Biblcal Passover meal. After being in shock for a number of days, I began to search the Scriptures to see whether this was true. We are called to be as the Bereans, and to search the Scriptures. We recall that the ‘Old Testament’ Scriptures were the only Scriptures the Bereans had in those days, as the New Testament writings had not yet been written. What I found as I searched the Scriptures, was that in all the Old and New Testament writings, the Passover is one of eight Feasts (‘Appointed Times’) of the Lord (Leviticus 23:1-44) that all His people are commanded to keep. Throughout the Scriptures, we can see clearly that the ‘Last Supper’ was actually the annual Passover meal, which as Believers, we are enjoined to eat (Leviticus 23:5; Num 9:2,4; 1Co 5:7-8). 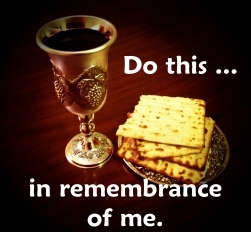 Yahushua (Jesus) tells us that the required Unleavened Bread of Passover speaks of His body, and that the (third) cup of wine (Cup of Redemption) after the Passover meal speaks of His Blood, the Blood of the New Covenant (Mark 14:22-24; Luke 22:19-20). Yahushua (Jesus) goes on to say that if we do not eat His Flesh, and drink His Blood (the Bread and the cup of Passover), we have no life within us (John 6:53); but that those who do eat His Flesh, and drink His Blood (the Bread and the Cup of Passover), dwell in Him, and have eternal life (John 6:54-56). We must be reminded at this point, that our redemption does not depend on whether or not we keep the Passover Feast. Instead, our redemption depends only on our willingness to accept His Blood as our substitute sacrifice. Our keeping the Passover and other Feasts is simply an indicator of our willingness to walk in obedience to Him. Yahushua (Jesus) tells us that our love for Him is seen in our obedience to His Words (Exodus 20:6; Deuteronomy 5:10; John 14:15,21). How did the modern-day Believers go astray from the doctrine and practice of the early Believers? First, in the early days during the first few centuries, the doctrines and practices of the Believers were ‘ethnically cleansed’ of anything that appeared ‘Jewish’ (See Things Your Pastor Never Told You About the Early Church Fathers). Second, certain parts and pieces of the early doctrines and practices were retained, and given new, man-made names and meanings devoid of any ‘Old Testament’ references. Thus much of what has been handed down, taught and practiced in today’s congregations is simply a mixture of man-made tradition along with a little Truth. Indeed, during the history of the second and third century Believers, the practice of observing the Passover just as Messiah did sparked a great controversy. It was during this time that Rome began to persecute and excommunicate those who observed the Biblical Passover and Lord’s Supper at the time specified by the apostle Paul (1Co 11:23). As the controversy grew against holding Passover on the night of the fourteenth of Abib rather than on the first day of the week, the Believers began to be labelled by Rome with the derogatory term Quartodecimans or “Fourteenthers.” For further study, see the Wikipedia article on the Christian Passover. We are warned however, by the prophet Isaiah, by the apostle Paul, and by Messiah Himself, that a man-made ‘substitute’ for passover is considered the ‘table of devils,’ and is spiritual idolatry and fornication. For Scripture references, see the full-length article, Eating Things Sacrificed Unto Idols: A Warning to the Bride. The Heavenly Father is now sounding the Trumpet. He is awakening the Believers from their spiritual slumber. He is giving His people a choice. The cry is going forth again today, “Choose you this day whom you will serve” (Joshua 24:15). A remnant of Believers are reading the Scriptures for themselves. They are choosing to return to the Biblical basis of The Faith once delivered to the Saints (Jude 1:3). 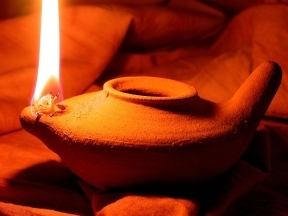 Believers are beginning to find out for themselves how and when to keep the Biblical Passover, as well as the other Biblical Feasts ordained by our Heavenly Father (Leviticus 23:1-44). Believers are choosing to cleanse themselves through their obedience to the Scriptures (1Peter 1:22; 1John 3:3). Believers are removing from themselves all the spiritual abominations and uncleannesses, the idolatrous doctrines and practices found in most congregations today (See Related Articles below). They are cleansing themselves, that they might be found to be without spot or wrinkle when the Master returns (Ephesians 5:26-27). Believers are preparing themselves, and making themselves ready (Revelation 19:7) — just as a Bride prepares for her soon-coming Bridegroom!